This story is finally breaking in the mainstream press. I had the opportunity to visit the site this dinosaur was excavated from when I went on the dino dig this past summer with Marmarth Research Foundation. I'm looking forward to seeing the National Geographic program this week. This one fossil has the potential to change a lot of what we think we know about dinosaurs. 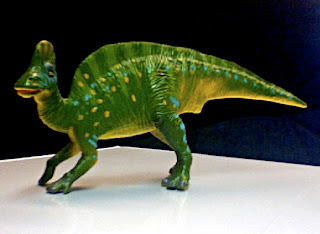 I guess my toy Hypacrosaurus (a Hadrosaurid dinosaur) pictured above is fairly accurate with those stripes. Of course who knows what color they were. I personally think the teal spots are a bit much. Don't hate on the dinosaur fashion.